An investor note from UBS seen by Appleinsider cites a survey of consumers across five countries in suggesting the purchase intention for the iPhone is "down across the board," with the United States down to a five-year low and China at a new low. It is claimed older models are now taking up a bigger portion of the product mix, with new models now accounting for 58 percent of sales compared to the 70 percent to 75 percent claimed by flagship models seen in previous years. Based on the results of the survey, UBS blames the "particularly weak [iPhone] XR demand" for the drop, a claim seemingly bolstered by "ongoing downward XR revisions in the supply chain." 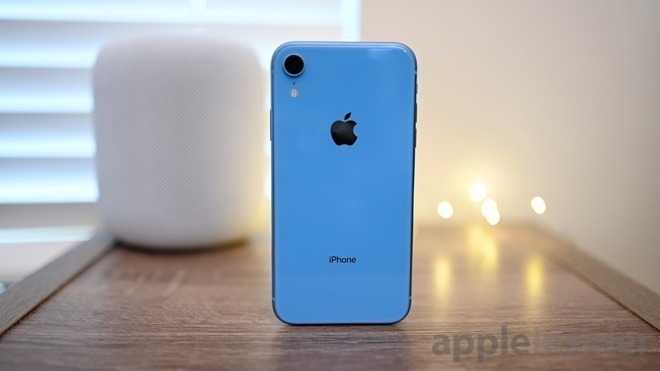 The data suggested the iPhone XR made up approximately 20 percent of new iPhone demand across all models, or at 43 percent for all 2018 iPhone models despite the production cut reports. "While many suppliers have already pre-announced, this indicates that XR supply remains too high and does not support any near-term inflection in the supply chain," declares the analysts. While more survey respondents are buying more older models, UBS notes this issue is offset by the mix of iPhones worth $999 or more increasing significantly, by 50 percent this quarter compared to 34 percent one year ago. Assuming no change in memory mix, this is said to assume an average selling price (ASP) growth of 6 percent year-on-year, higher than the 5 percent modeled by the firm. "Weak iPhone demand is hardly and the narrative is clearly going to keep shifting to Services," writes UBS, adding that this is still enough to drive its price target down from $225 to $210. Despite the reduction, Apple is still rated as "buy" as it appears to be "discounted by the recent stock correction." For the smartphone market as a whole, UBS warns that purchase intent has reached the lowest point in the fourth quarter ever for the United States, United Kingdom, China, Germany, and Japan. Only 41 percent of consumers are planning to buy a new mobile device in the next year, down from the 46 percent observed last year. India was noted to be the only region in the survey to have strengthened intent, rising to 37 percent from 29 percent. "We believe risks of the smartphone market going into decline are increasing, and we lower our assumed unit growth for 2019 to 0 percent from 2 percent," UBS writes. There should be a recovery in demand overall in 2020, with a 2 percent growth in purchase intent expected due to the introduction of 5G-compatible and folding smartphones. Apple's retention rates are strong at 83 percent compared to Samsung's 72 percent, with its 6-percent ASP growth also supporting revenues, leading UBS to believe there is little to disrupt the situation in the near term. Even so, iPhone revenue is tipped to decline by 3 percent for the full year of 2019, partly due to falling consumer interest in the 2018 models, which suggests "the market needs an innovation kick to stimulate demand," similar in tone to HSBC's note from Tuesday. For what consumers see as important in smartphones, face-based biometric security like Face ID remains a low priority as the second least important factor when buying a phone, but Apple's Face ID has seemingly seen growth in importance with iPhone users compared to the Android market's equivalents. Mobile payments have also improved in importance, but is said to be still quite low on the list.